I might be a bread geek, or there’s a very good chance that I’m in the process of becoming one. By bread geek, I mean that I’m fascinated with all things related to baking bread not that I have any expertise in baking it. I received a review copy of 52 Loaves: One Man’s Relentless Pursuit of Truth, Meaning, and a Perfect Crust , and the author’s goal made perfect sense to me. William Alexander set out to bake a loaf of peasant bread each week for a year with the hope of figuring out how to make perfect bread. Along the way, he sought out experts in everything from baking to yeast to milling and learned about bread from every angle. I was intrigued by that information shared throughout the book. 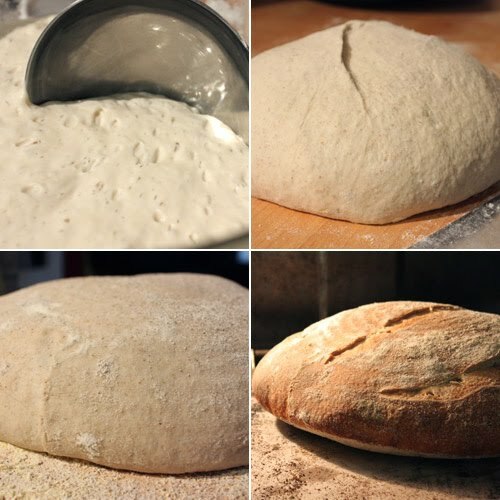 He started by questioning why most flour is enriched and learned about why the vitamins were added and that added malted barley assists yeast in feeding on sugars in the flour. Then, he moved on to questioning the chlorine in the tap water he was using. He learned about conditioning the dough, or an autolyse, which involves letting the dough and the glutens in it rest before being kneaded. And, then he learned about sourdough or levain. My sourdough starter is my hard-working buddy who has been helping with my bread baking for over a year now. So, I was geekily thrilled when he started baking with sourdough. He does go a couple of steps further than even I would when he grows his own wheat and sets out to build his own bread oven. Although, I’d love to have a bread oven if someone else built it. He explains the bread baker’s percentage which I previously didn’t know. The details and trials and tribulations are entertainingly described with plenty of self-deprecating humor. I won’t reveal the end of the story, but I will say that ultimately the journey was about more than just baking bread. It was about setting a goal, becoming immersed in it, and learning more than you ever thought you would in trying to attain it. At the end of the book, there’s a description for how to make a levain and four bread recipes. I attempted the Pain au Levain Miche. Alexander explains that this is a very wet dough that will flatten out on the peel. For me, it not only flattened, it stuck like glue to the peel. It was a misshapen, flat, ugly dough pile by the time I got it into the oven. It’s in my freezer now, but it’s destined to become croutons or possibly just breadcrumbs. Next, I tried the Pain de Campagne, and that’s the bread pictured here. 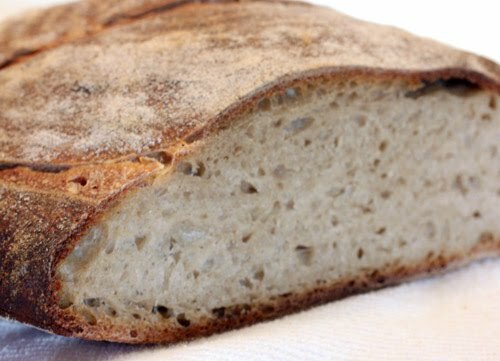 It’s made from levain, or sourdough starter, bread flour, whole wheat flour, rye flour, salt, a tiny bit of commercial yeast, and water. The dough ingredients were mixed and left to autolyse for 25 minutes. I used my mixer with a dough hook to do the kneading after that. With a mixer, it was only kneaded for about three minutes. Then, the dough was left in an oiled bowl to ferment for five hours. After it had risen, the dough was set on a floured surface and shaped into a boule. I placed it in my bread proofing basket, covered it with plastic, and refrigerated it overnight. It could have just sat for another two hours before being baked. The next morning, I removed the dough from the refrigerator while the oven heated to 500 degrees F. Following the recipe instructions, I placed a cast iron skillet on the bottom of the oven. After slashing the loaf and loading it into the oven, one cup of water was poured into the skillet. Wear an oven mitt when adding the water. The hot steam rises immediately. The oven temperature was reduced to 480 degrees F, and the bread baked for 25 minutes. The oven temperature was reduced again to 425 degrees F, and the bread baked for another fifteen minutes or so. It should reach an internal temperature of 210 degrees F. Then, the oven was turned off, and the bread remained in it for a few more minutes before being cooled on a rack. I had much better luck with the second loaf. The dough wasn’t sticky, and I had no problems sliding it onto the baking stone from the peel. It came out of the oven crunchy crusted and not too densely crumbed. The flavor was very good, and the whole wheat and rye flours gave it good character. In the past, I’ve used a spray bottle to spritz the oven for steam, but I may now be a convert to the hot skillet with water method. Reading this book was a lot of fun, and I learned things about bread baking science along the way. Now that I’ve been introduced to the bread baker’s percentage and learned more about hydration levels of doughs, I’m inspired to learn more and add to the weight of my bread bookshelf. 1. At least two hours before beginning (you can do this the night before), feed the levain as follows: Remove from the refrigerator and add equal parts flour and room-temperature water (I use about 130 grams each, which replenishes what I'll be using in the bread). Stir well, incorporating oxygen, and leave on the countertop with the cover slightly ajar. The starter should be bubbling and lively when you begin your bread. 2. Place a large mixing bowl on a kitchen scale and add each ingredient in turn using the Tare button to zero out the scale between additions. Mix thoroughly with a wet hand until the dough is homogenous. Cover and leave the dough to autolyse for about 25 minutes. 3. Remove the dough to an unfloured countertop and knead by hand for seven to nine minutes (or if you insist, you can use a stand mixer with a dough hook for two to three minutes) until the dough is elastic and smooth. During the first minutes of kneading, a metal bench scraper is useful to scoop up te wet dough that clings to the countertop. 4. Clean out the bowl (no soap, please), mist with oil spray, and replace the dough, topping with a piece of oiled plastic wrap. Ferment at room temperature (68-72 degrees F) for four to five hours. 5. Remove the dough, which should have risen by about half, to a lightly floured countertop and gently press into a disk about one inch high. Form a boule by gathering the sides into the center, creating surface tension, then place seam side up in a colander covered with a well-floured linen napkin. Return the plastic wrap atop the dough and set aside to proof. Meanwhile, place a pizza stone in the lower third of the oven and an old cast iron skillet or pan on the bottom shelf. Preheat the oven to at least 500 degrees F.
6. After one and a half to two hours, carefully turn the loaf onto a baker's peel that has been liberally sprinkled with rice flour or cornmeal. Sprinkle the top of the loaf with rye or rice flour (not white flour, which turns brown) to get that country "dusted" look. 7. Make several symmetrical slashes (grngnes) with your lame or single-edged razor. 8. Immediately slide the loaf onto the stone and add one cup water to the skillet (wear an oven mitt), minimizing the time the oven door is open. Reduce oven temperature to 480 degrees F.
9. After 20 to 25 minutes, or when the loaf has turned dark brown, reduce oven temperature to 425 degrees F.
10. Continue baking until the loaf registers 210 degrees F in the center (about 50 to 60 minutes total) with an instant-read thermometer, or until a rap on the bottom of the loaf produces a hollow, drumlike sound. Return the bread to the oven, with the oven off, for about 15 minutes. Allow the bread to cool on a rack at least two hours before serving. Your pain de campagne looks wonderful! 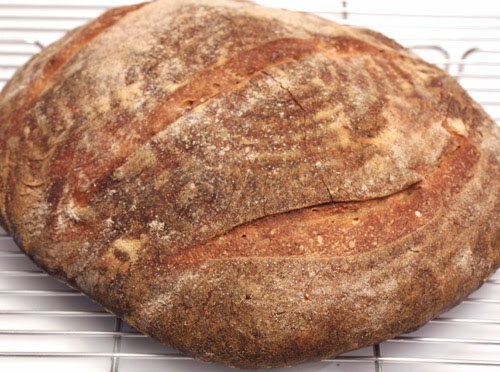 I like rustic bread like this, sometimes I don't have any luck with my first batch, but you know what they say, right. Practice an practice. Yours came out beautifully. It looks delicious! I love such crunchy crusts. Perfect with cheese and pâté. Pain de Campagne is our all time favorite! How wonderful to be able to make it at home! That is a beautiful loaf of bread!! The crust looks perfect. Surely, there's a patch in your backyard large enough to do this. I love just love pain de campagne; I can't think of anything I would rather have for breakfast with a thick slab of butter! Pain de Campagne is one of my favorites! I admire your passion for baking bread. It is on my list of things to master. Your loaf looks fabulous. I love this kind of bread and when you make it yourself the house smells divine. Your bread always look so perfect! Wonderful loaf, Lisa! I think I prefer bread geek than bread freak, but either will certainly apply to us, don't you think? I have that book on my wish list, together with a bunch of others, quite a few recommended by you. Wow, absolutely spectacular! The crust looks amazing. This is my favorite kind of bread! I bet it's absolutely delicious! I am going to steal the cast iron skillet idea too. Geek or not, that is gorgeous bread. I have about six weeks before my birthday and I have got to get on that started I promised myself I would start before 40! Looks fantastic! I've been working on my sourdough starter for about a year as well. I've almost perfected my sourdough ciabatta. I'm super happy to see he's used weight rather than volume in the recipe, just about every bread baking book I pick up has volume measurements and I drop it back down right away in disgust. What a neat sounding book! I will have to look into it. Your bread looks great! Yum, yum, yum. This bread looks awesome. This loaf looks delicious! Perfect crumb, perfect shape. Don't you just love your starter?! What an interesting sounding book and what a way to focus your craft and interests. I'd love to be able to bake a loaf of bread and have it come out like the one you pictured here. this pain de campagne looks wonderful...just like the one I buy at Beaulieu and I'm sure it tastes as magnificent. I'm not your regular bread baker, but it looks so great, I MUST try it...will take the recipe along to Coin Perdu, our moutain home on correze! What a handsome looking loaf! I love baking breads too (but easier ones :-) )... The home smells divine with a fresh baked one. Nice job! I just read the book and tried the recipe, and it wasn't this sucessful. I too am beginning to think that I'm a bread geek.